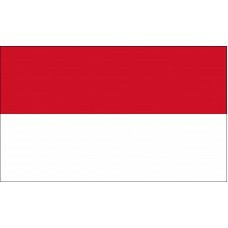 The flag of Indonesia is a basic two color design with the top half being red and the bottom half white. It was first raised in public on August 17th, 1945 at the Indonesian Declaration of Independence in Jakarta and again, when the Dutch transferred sovereignty on August 17th, 1950. The design has remained untouched since. The Indonesian Navy, however, uses the Naval Jack flag of Indonesia exclusively, which is comprised of nine alternating red and white stripes, flying from the mast of every active warship. It is said that the Indonesian flags red and white colors have evolved from the Majapahit Empire banner used in the 13th century. The cotton woven fabrics were white in color and the red was one of the earliest natural dyes of ancient Indonesia, obtained from teak leaves, flowers called Averrhoa Bilimbi, and the skin of the Mangosteen fruits. 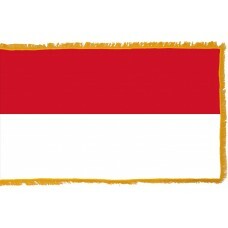 In the early 20th century students used the red and white colors as an interpretation of nationalism against the Dutch, whilst in 1928 the modern red and white flag was first flown in Java and prohibited under Dutch rule but Indonesia's Declaration of Independence in 1945 saw the country adopt this as its national flag and have used it ever since. There are a few ideas as to what the red and white colors stand for, one is red is for courage with the white symbolizing purity. A different suggestion is that red is symbolic of the human body or physical life and the white being that of the soul or spiritual life. Together they are the complete human being. Red and white are also popular food colors used in traditional Indonesian cooking. The white color is said to represent sugar, while the red represents red rice. Both of these ingredients are daily staples in Indonesian cuisine. The governance regarding the use of the flag of Indonesia states the flag can be raised between sunrise and sunset. There are some exceptions for night usage. There are also certain dates that the flag must be flown including Indonesian Independence Day and the flag is often displayed at schools, offices, homes, and colleges. The flag may be used as the coffin cover for Presidents, current and former, Vice Presidents, Members of Cabinet, Speaker of People's Representative Council, Heads of Government, Indonesian Armed Forces, and members of the Indonesian National Police. There are certain days when the flag should be displayed at half mast to show a sign of mourning. December 26th, is one of these days, to demonstrate the mourning for victims of the 2004 Indian Ocean earthquake and tsunami along with other mourning days noted by the government. The flag must be displayed in pristine condition. Citizens are banned from causing damage to the flag, destroying the honor of the national flag or using it in a commercial way. It cannot be used as a cover for a roof or wrapping for goods. Indonesia is the world's largest island country situated between the Indian and Pacific Oceans. The Capital of Indonesia is Jakarta.